Discussion in 'Mac Accessories' started by nathandn, Dec 24, 2014. I have no idea how this even came to be. I bought my new 13" rMBP ecstatically yesterday as a Christmas gift to myself. I charged it last night, and took the charger out overnight, letting it lay on my floor. This morning when I woke up I opened my Macbook and decided to charge it, and to my surprise when I plugged in the Magsafe the light indicator would not turn on. As it turns out, the cable broke and the wires were exposed. To my understanding, I did nothing to cause this. But logically something must have been done to the wire overnight because it was working before I went to sleep. I have no pets that could chew the cable, so my only conclusion is that it was somehow in a strained position on my floor causing the cable to rip. I took the charger to the Apple store about an hour ago and they told me that they couldn't do anything, as it was not covered under my warranty (called it accidental damage). I was super bummed considering all the apple stores on the sub and thinking that they would give me a new one (the lady on the phone that I talked to from Apple said that it would be covered under warranty). tl;dr: Do I buy a new Apple MagSafe 2 60W charger or do I buy a 3rd person charger? I would buy a legitimate charger. I would also get an apple charger. You do not want a 3rd party charger. I would also ask to talk to the store manager... or call Apple and ask them to send you a replacement via mail. I my experience... Apple support is generally good and errs on the side of the consumer. I would think this would be especially true for something that failed on Day 1. Do they even make third-party MagSafe chargers anymore? I thought a few years back HyperMac made a cool external battery that had a MagSafe adapter on it and Apple sued them for that (as that's a copyrighted design). OP, if a credit card was used to buy this gift, if might offer accidental damage coverage for a period of time. I know my AMEX does. This looks like the cord was accidentally ran over by a rolling chair. You can just replace the cord. If you are not comfortable opening the charging brick or don't have the tools, you can just simply attach the two pieces of wire together with wire nuts. Strip the outermost layer of insulation about an inch or more, and strip the inner wire about a half inch or more. Repeat for the other wire, and then attach both wires with wire nuts. Make sure the two wires are not touching. Then you can wrap it up with e.tape. You don't need to pay $80 for a charger when the one you have is just fine, only the cord is damaged. It is very wasteful to throw away the charger just because the wire is damaged but the transformer is fine! I hate that! It is safer to repair your own cord than to buy a counterfeit charger. Perhaps you have a mouse/rat? Too bad. But this is easily repairable at practically no cost. Cut the cable with wire cutters or sharp scissors. Expose 25mm or so of each wire on each end of the severed cable. If you have a heat gun, now is the time to slip some heat-shrink tubing over one side for each wire and for the cable itself. Trim about 7mm of insulation off each wire. Twist each wire together with its opposite end. Solder (preferably) or use small screw-on wire-caps that any hardware store will carry. Shrink the shrink-tubing on the wires or tape each wire individually with electrician's tape, and once you're satisfied there will be no wire-to-wire contact, shrink the outer tubing or tape the whole assembly together. Voila, all fixed, and lesson learned. Having said all that, $79 is not at all a bad price for a charger for a high-end laptop and is a small price to pay for a charger that is safe. There are many horror stories about cheapo off-brand chargers; folks have been electrocuted by them, or their machines have been damaged. Just don't. Or perhaps you could visit the Genius Bar at an Apple Store? 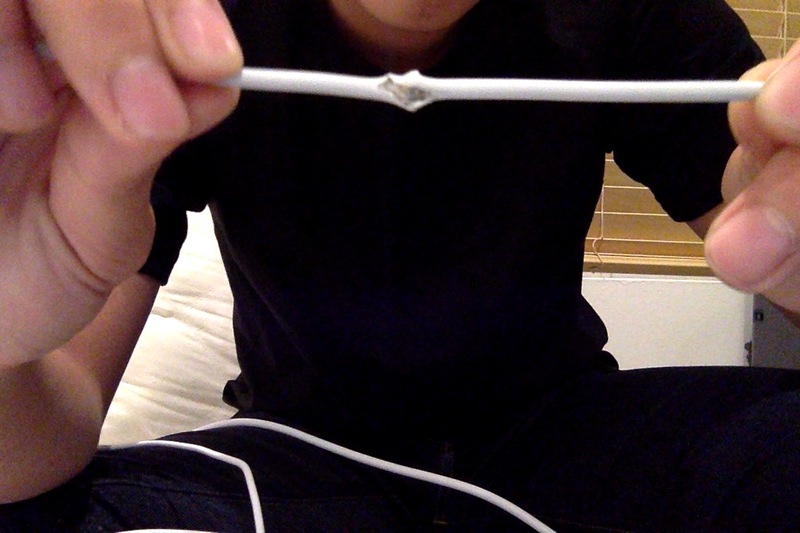 I had a charger that came with my second hand MBP that looked like a cat chewed on it. I brought it to the Genius Bar and they replaced it for free. YMMV, but you have nothing to lose by trying. It never ceases to amaze me how people will reply to a thread without ever reading the original post. Somehow they think that all of the important information needed to make a reply is contained in the title of the thread. applestore is notorious for saying no as much as possible, i had the same problem as you, 1 year down and the cable worn down from my travel, they call it my fault, i call it crap quality manufacturing, two sales guy even gang up on me at the store telling me it's my fault. first mag charger broke down on me mind you, so it's not like i don't know how to properly handle them. i called up apple, and 10 mins later the rep placed a replacement for me without much hassle. so yeah avoid applestores, alot of them do not represent the same customer friendliness as their online department. I've had 4 of them replaced at an apple store. My nephew has had 3 adapters fray over 4 years on his 2010MBP right at the "L" connection on his Magsafe1 connection and my wife has had 1 fray at the "T" connection on her Magsafe2. Each time was less than 20 minutes and walked out with a new adapter. My nephew just got a new adapter 2 months ago and his MBP is well out of warranty. It may be your local store but I have never had an instance where an Apple employee ever said this is your fault and we won't cover it. i not only had one guy telling me it's my fault, but another sales person joined in and both were blaming me saying i mis-treated it. from thn on i only do replacement and warranty issue with the online division. sure it take a few day to ship it but i dont have to deal with rude pricks at the apple store. for me the apple store experience is ruined, everytime i go near one of them that memory of me had to argue with two sales guys comes right back to me, the only reason i even buy apple products nowadays is their online support. if it weren't for that i would be on linux long ago. And it never ceases to amaze me the rude responses to someone making a mistake. I'm sorry my reading comprehension isn't as good as yours. Sorry OP, I must not have understood that last paragraph. I almost think trying again might be worth it, but definitely stick to the original Apple charger. Perhaps a phone call to Apple Care might have better results? I would be right there with you if I had an experience like that. That sounds more like Wal-Mart customer service than Apple.